Given a choice, I will not normally hike in the Shenandoah Northern District, as it is closest to the urban ring of DC. Choosing a holiday weekend was probably not the best time to head up that way, but I left early in the morning back on Memorial Day and did not find anyone in line ahead of me as I rolled into the entrance station on U.S. 211 between Culpepper and Luray. Seeking a loop trail that I had never before attempted, I was also looking for something that would take me into the wilderness area of the Park and would provide a challenge. I know other folks who had hiked the Jeremy's Run/Knob Mountain loop and said it was a nice hike, but I had never experienced it. And, surprisingly, I didn't see anyone for the first 6 miles of my hike - over Knob Mountain. And there were only a few folks along Jeremy's Run. Topo Map of the hike: Link. The hike starts and ends at the Elkwallow Picnic Area, which on Memorial Day had a good number of picnic tables filled with folks, even though the trails into the park were uncrowded. The loop starts off taking the Appalachian Trail southbound, then turns onto the Jeremy's Run Trail and seamlessly enters into the designated wilderness area - no signs to tell you you are in wilderness. The hardest part of the hike is the brief climb on the Knob Mountain Cutoff Trail, which takes you from the Jeremy's Run Trail to the Knob Mountain Trail. The Cutoff Trail doesn't show on earlier topo maps or on the 4th Edition of the PATC's Map 9, (c) 1948, and was clearly created to assist with this loop hike. Difficulty lessens immediately upon turning onto the wonderfully mellow Knob Mountain Trail. In the Fourth Edition of Guide to Paths in the Blue Ridge (1950), the precursor to today's Appalachian Trail Guide to Shenandoah National Park, there is a brief description of today's Knob Mountain Trail. Back in 1950, this route was "a combined fire road... and foot trail." The road ended just north of the Knob Mountain summit, and is marked to this day by a concrete post that would otherwise have no reason to exist - it isn't at the summit, and it isn't at a trail junction. The road was built by the CCC. From the end of the road, a foot trail scaled the summit, a summit which, sixty-five years ago, "afford[ed] a 360-degree panorama and this is perhaps the most scenic crest line trail in this section of the Blue Ridge." Now that same summit is tree covered and lacks a summer view. I can't help but wonder what this part of the hike looked like, some 65 years ago. From the summit, the trail "drops some 1,600 feet to Jeremys Run" over 3.3 miles of trail constructed in 1935 by the CCC - when the northern section of today's trail still accepted vehicles. Part way down next to the trail is a small walled spring, which was described in the 1950 guide. At the end of the Knob Mountain Trail, you will be at the low point in the hike, about 1000 feet elevation, and the furthest point from the starting trailhead. Climbing the Jeremys Run Trail, however, is much easier than going the opposite direction on the Knob Mountain Trail. While the KMT dropped at an average 12.6% grade, the Jeremy's Run Trail climbs at a consistent 3.6% over its first 4.5 miles, before becoming slightly steeper over its last 3/4 mile. I passed by a campsite that was right on the stream known as Jeremys Run. I felt like I was intruding on these folks, who were out of their tent cooking breakfast not more than 100 feet from where I hiked, and right next to the river. But, I was on the trail and was not the person who chose a campsite so visible to passing hikers! The entire loop took me 4 hours and 40 minutes, with 11 minutes stopped. The trip was 12.8 miles long and ascended 2489 feet. 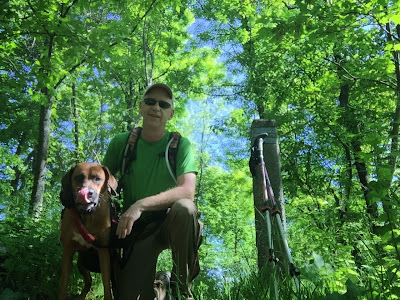 Later in the summer, I returned to complete the Knob Mountain Trail, hiking it again from the Matthews Arm Campground to the summit of Knob Mountain. The trail starts at a road intersection near the campground. There is a large wooden sign announcing the trailhead - not the usual concrete post. I think this is because the old Knob Mountain road intersected with the present road about 100 feet from where the trail currently leaves the road. Almost immediately, road and trail merge, heading for the summit of Knob Mountain, about 4.5 miles away. If you are looking for a pleasant, easy hike in a remote section of the park, this may be a good bet. I saw more bears (2) than humans (0) on this hike.